Over the years, tourism scholars have come up with a many ways to segment tourist markets so that different products can be more precisely targeted to potential travelers. 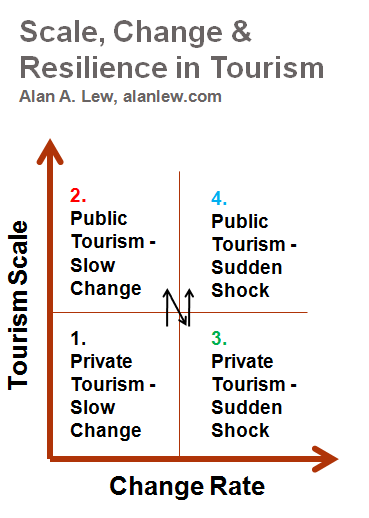 Probably the most famous of these is Stanley Plog’s division of the both travelers and destinations into “psychocentrics” (associated with security, familiarity and mass products) “allocentrics” (associated with risk taking, extocism and niche products). Although many different terms have been applied to this safety-risk dualism, with the goal of showing nuances, the fundamentals of the dichotomy have remained consistent. Like others, I am not going to venture far from the basic model, but I do hope to offer some insights by introducing a geodesign perspective that has not, to my knowledge, been suggested before. That perspective is the concept of “distance”. There are essentially three forms of distance: Geographical, Social and Psychological. Each of these can tell us something about the different ways people travel. Geographical distance is based on absolute measurements on the planet earth, measured in miles or kilometers. For tourists, it becomes quickly complicated by complicated roads and pathways between where we are and where we want to go. GPS receivers and online maps help us to navigate in a mostly more efficient and timely way, assuming they are based on current and correct geographic information. However, for tourists, a more desirable route may be one that encompasses certain kinds of scenery or attractions, which can be highly subjective to the individual tourist. What is happening here is the transformation of geographical distance into social and psychological distance. Social distance is how the majority of people in a society define the distance between one place and another. This can be totally different from geographic distance. Political borders, for example, are a more formal social structure that has a huge impact on travel distance – both actual and perceived. One reason, among many, is that political borders increase the time it takes to get to a place, which is often be a more important distance factor than actual geographic measurements. Another example is the distance between different socio-economic groups in a society. We talk, for example, about the huge distance between the privileged lives of those in houses on the hill (the upper class) and homeless street life on skid row. We talk about not wanting to go to certain neighborhoods for safety and cultural. These perceptions, while grounded in society, also have major psychological components. Psychological distance is how our brains perceive distance. We can only see clearly over a fairly short distance (even with glasses on). In addition, our brains can only comprehend and process a somewhat limited amount of information. Where we focus our eyes is what we cognize and remember the best. While we see the background and larger context of objects, elements in that broader scan are not stored in detail in our memory. For tourists, this means that we can only comprehend a selected part of the destinations we visit. To fully appreciate requires time, repeated visits, curiosity, an openness to the unexpected, and patience. Most mass tourists are not able to devote themselves to a place in these ways, and so the tourism industry does its best to help direct a short term focus on immediate objects in front of the tourist – not in the distance. Together, geographic distance, social distance and psychological distance are key elements that reflect the integrated nature of geodesign. And together, the challenges of overcoming geographical distance, social distance and psychological distance contribute to making a lot of travel a short-sighted experience, even when we travel far (for the psychocentrics among us). On the other hand, some travel can traverse great chasms and lead to unknown worlds, even if the actually journal is very close (form allocentrics). It all depends on distance to which the tourist is willing to go…. The South China Sea? The West Philippine Sea? The East Sea? All of these are names that are given to the same body of water. Vietnam refers to it as the East Sea and the Philippines recently started to officially refer to it as the West Philippine Sea. Most of the rest of the world continues to call it the South China Sea. Given the long simmering, and recently exploding, territorial claims to the small islands that sprinkle this territory, I would guess that we may see more new names emerge. Perhaps the North Malaysian Sea, or just the North Sea, from the perspectives of Malaysia and Brunei, who also have territorial claims there? Taiwan and Indonesia also have interests in these waters. Although it has barely been mentioned in the U.S. press, for those who follow international news in general, and Asia news in particular (as I do), the recent disputes over this body of water is alarming. It started in May when a Chinese ship cut an underwater exploration cable connected to a Vietnamese oil survey ship in Vietnam’s exclusive economic zone waters. The Chinese claim that the survey was in its territorial waters and as such were illegal. This resulted in anti-Chinese protests in Vietnam, followed by retaliatory attacks on Vietnamese‘s internet government websites by Chinese hackers. Last week, Vietnam initiated live-fire naval exercises and also chased Chinese fishing boats in the disputed area. Earlier this month, the Philippine government complained that Chinese ships were posting marker signs on a coral reef just off the island of Palawan, within the exclusive economic zone of the Philippines (but also claimed by China). This has resulted in public (not from the government) calls to boycott products made in China (most of which are actually smuggled into the Philippines to avoid import taxes). Vietnam has suggested that the U.S. should help to settle these disputes, and the US government has expressed concern over China’s naval activities in the region. China has rejected any outside intervention, although the issue is likely to be a major topic of discussion at upcoming ASEAN meetings. I see this as a major geodesign issue. The UN Convention on the Law of the Sea (UNCOLS) was an international effort to resolve spatial territorial claims over sea and ocean waters by establishing guidelines on where to draw territorial boundaries. It was an effort at designing the earth in a way that would make it more clear and predictable for countries and their citizens. It was signed in 1982 and became effective in 1994, though only 60 countries have ratified it. Approaching the current South China Sea dispute as a geodesign teaching moment case study demonstrates the role of international treaties and law, nationalism, and international relations, especially in terms of political power, military power and economic power. Although seldom recognized, these are clearly integral elements of applying geodesign at a regional and global scale. All territorial boundary lines were created, or are being created, through tensions between one side of the boundary and the other. While these tensions are seldom as dramatic as those of the South China/West Philippine/East Sea, they still exist and need to be recognized in designing a livable and thriving planet. I feel as though I have a good understanding of what Geodesign is. However, like with most things, my definition is often different than others. I searched for a few definitions and came across these from Philip Murphy…. 4) GeoDesign is any time you do landscape planning where you iteratively develop by a) sketching (prototyping, visualizing) a design on a map, and b)having an analysis capability that can calculate (in real time) consequences of that that sketched design, and c) elicit feedback (in real time) to improve the design.